Make yourself at home in one of the 128 air-conditioned rooms featuring flat-screen televisions. Complimentary wireless Internet access keeps you connected, and cable programming is available for your entertainment. Private bathrooms with shower/tub combinations feature complimentary toiletries and hair dryers. Conveniences include desks and coffee/tea makers, as well as phones with free local calls. 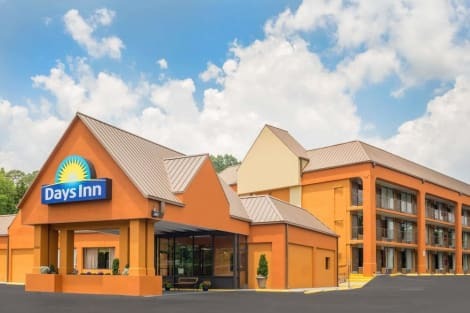 With a stay at Days Inn by Wyndham Knoxville East in Knoxville, you'll be within a 10-minute drive of Knoxville Zoo and Knoxville Civic Auditorium and Coliseum. 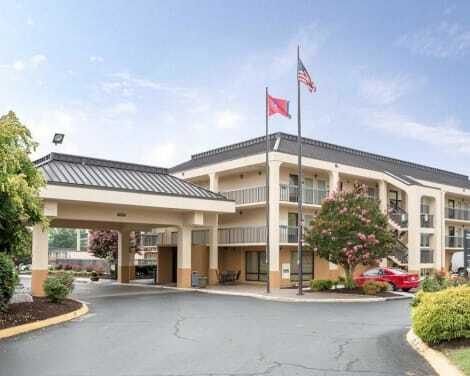 This hotel is 8.2 mi (13.2 km) from University of Tennessee and 6.6 mi (10.6 km) from Market Square. With a stay at Americas Best Value Inn & Suites - Knoxville North in Knoxville, you'll be within a 10-minute drive of Knoxville Convention Center and Knoxville Civic Auditorium and Coliseum. This motel is 5.9 mi (9.4 km) from University of Tennessee and 5.2 mi (8.3 km) from Market Square. Grab a bite from the grocery/convenience store serving guests of Best Western Knoxville Suites - Downtown. A complimentary full breakfast is included. With a stay at Clarion Inn & Suites Near Downtown in Knoxville, you'll be within a 10-minute drive of Knoxville Convention Center and Knoxville Civic Auditorium and Coliseum. This hotel is 5.9 mi (9.6 km) from University of Tennessee and 5.3 mi (8.5 km) from Market Square. With a stay at Mainstay Suites, you'll be centrally located in Knoxville, within a 10-minute drive of Knoxville Convention Center and Knoxville Civic Auditorium and Coliseum. This aparthotel is 5.9 mi (9.4 km) from University of Tennessee and 5.2 mi (8.3 km) from Market Square. With a stay at Comfort Suites North in Knoxville, you'll be within a 10-minute drive of Knoxville Convention Center and Knoxville Civic Auditorium and Coliseum. This hotel is 6.1 mi (9.8 km) from University of Tennessee and 5.4 mi (8.7 km) from Market Square. lastminute.com has a fantastic range of hotels in Knoxville, with everything from cheap hotels to luxurious five star accommodation available. We like to live up to our last minute name so remember you can book any one of our excellent Knoxville hotels up until midnight and stay the same night.